Impact-Echo is a nondestructive test method for evaluating concrete and masonry structures. 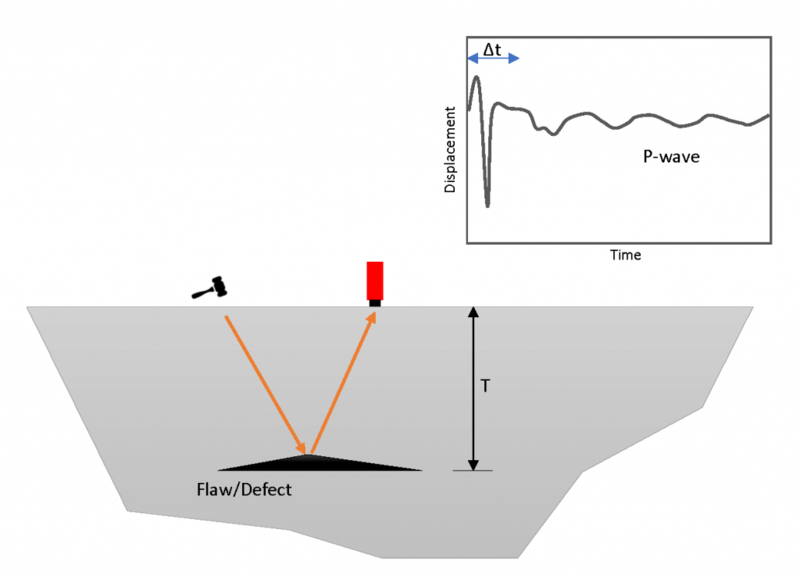 The test utilizes stress waves (sound) that is normally generated through striking concrete by an impactor (Impact), and recording the reflections and refraction from internal flaws and other boundaries (Echo). Generally, a pulse is generated by an impact at one single point. The resulting stress wave propagates in all directions. In this regard, the generated wave lacks the directionality of a pulse that is generated by a large transducer (as in the case of ULTRASONIC PULSE VELOCITY). Since the reflections are arriving in all directions, the test method works best in slender element, such as piles where the external boundary guides the wave through the pile. In this particular application, the test has been standardized as low strain pile integrity test. Read more about PILE INTEGRITY TEST. The concept of the Impact-Echo test is illustrated in the Figure blow. A mechanical impact on the surface of concrete is used to generate the stress wave. The generate stress pulse propagates throughout the concrete along spherical wave fronts as P- and S-waves. Another component is the surface wave (R) which travels along the surface. As P- and S- waves propagate within concrete element, they get reflected by internal interfaces (concrete-crack, concrete-air, concrete-rebar) or external boundaries. The arrival of these echos on the surface induces displacement. This displacement can be measured by placing a sensitive transducer (which then converts displacement or acceleration into electrical voltage). Data is recorded by a data acquisition and data logging system. Data analysis can either be done in Time Domain, or the Frequency Domain. While time-domain analysis looks to be a very good an easy way of data interpretation for slender elements (as in the case of pile integrity test), it can be way too complicated in the case of thin slabs. For these components, analysis of the signal in frequency domain is preferred. Fast Fourier transform (FFT) technique is used to analyze the frequency content of the digitally recorded wave. In this method, a waveform can be represented as a sum of sine curves, each with a particular amplitude, frequency, and phase shift. According to N. J. Carino (2) The method is used to calculate the amplitude spectrum of the waveform, which gives the relative amplitude of the component frequencies in the waveform. 3- Locate defects such as delamination in concrete bridge decks. 4- Evaluate the condition of concrete retaining walls, dams, tunnel linings, sea walls. A recent study by researcher at Rutgers University, The University of Texas at El-Paso, and Federal Institute for Materials Research and Testing (BAM), published by the National Academies of Sciences, Engineering, and Medicine (Referred to as SHRP2) (3) summarizes some of the most widely used applications of Impact-Echo method. 2- M. Malhotra, V & Carino, Nicholas. (2004). CRC Handbook on Nondestructive Testing of Concrete. CRC Press Inc.
3- National Academies of Sciences, Engineering, and Medicine. 2012. Nondestructive Testing to Identify Concrete Bridge Deck Deterioration. Washington, DC: The National Academies Press. https://doi.org/10.17226/22771. This entry was posted in Bridge, NDT. Bookmark the permalink. 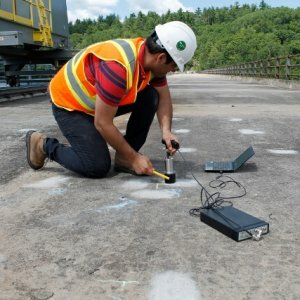 I like how you mention that using the impact-echo technique can be used to measure the thickness of concrete slabs and walls as well as tunnel lining and bridge decks. The impact-echo method is a non-destructive method that’s used to evaluate standing concrete and masonry structures to determine their structural soundness to check whether or not they are up to quality standards. While I haven’t the faintest idea on how to use this method, at least I can say from the information given that it can prove to be potentially beneficial for building safety in the long run.